The jhakaas family started the birthday celebrations last evening with a quiet dinner followed by a cake cutting ceremony. Time and again the Kapoor clan in Tinseltown have vocalised the aura of Sunita Kapoor in imbibing the values and adding the sparkle to the relationship they share. On her birthday today, Anil Kapoor and daughters Sonam Kapoor and Rhea Kapoor went all out as they shared throwback pictures with the alpha, wishing her on her special day. 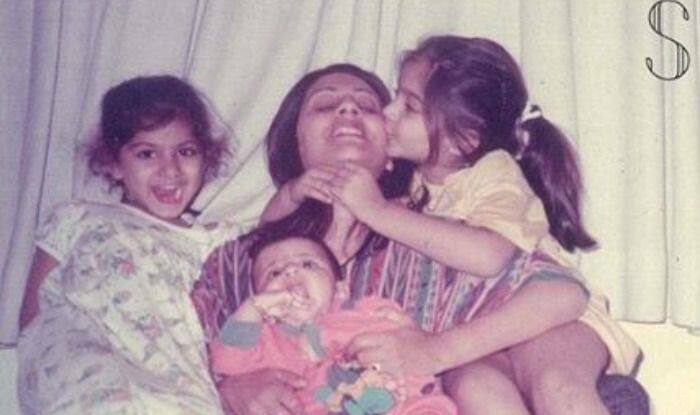 Sonam shared a picture in which she can be seen kissing her mother, while her sister Rhea sat on the opposite side and brother Harsh lay cuddled in her mom’s lap. The adorable picture was captioned, “There are no words for how much you mean to me. You have always been the ultimate role model, supporting me and helping me stand taller against whatever I may face in my life. It’s your strength and grace that keeps this family so happy and we all love you for it. Happy Birthday Mom! #mom #mother #momsarethebest #sunitakapoor” (sic). Rhea, on the other hand, too shared a picture from her childhood days, attending an event with Sunita, all dressed up. The cute pic was captioned, “Happy birthday to my conscience, oracle and constant challenger. I know you keep me grounded, sane and make me a better person. I don’t know how they do it but moms make you fly and put you in your place at the same time. I love you mommy happy birthday!” (sic). On the work front, while Sonam is shooting for her next film, The Zoya Factor, opposite Dulquer Salmaan, Anil will next be seen in Malang and though not much detail has been released about the movie, it will be releasing on February 14, 2020, going by Anil’s posts.